Later this month, the Italian publisher Einaudi will release their new edition of Pyg, as translated by Carla Palmieri. 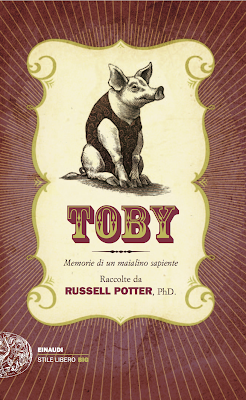 I was delighted to see that they retained the essential design of the original Canongate hardcover edition, with a few subtle changes -- of course, since the letters PYG don't work as a double-entendre in Italian, they (as did the Swedish publishers) changed it to TOBY. I was also pleased to see that the translator chose 'sapiente,' with its period connotations and Latin roots, and (just for fun) they added my PhD. after my name. My Italian being very limited, I can't really assess the book myself, though I hope to pass copies along to friends who are fluent/native speakers, and will look forward to their reaction. Many authors seem to me unexcited about their translations, but for me there could be no greater pleasure -- the translator, after all, has the unique task of ferrying meaning from the shores of one language to another (both ferry and translate share a root in the Latin fero/tuli/latus), and there is no other reader -- not even myself -- who has more carefully parsed out the various shades and shadows of meaning than a translator. I also love to think on how an edition in another language is, in a sense, entirely new -- and how it will garner the attention of an entirely new set of readers, readers with whom I would otherwise be powerless to communicate in their native tongue. And as to Italian -- which I'll always think of as the language of Dante -- I can't imagine a more fortuitous and fruitful shore upon which to arrive. translating "Pyg" into Italian was a challenge, but also great fun. I just wanted to thank you for your kind and insightful words. I can't wait to lay my hands on the book, and I do hope Italian readers will like it. Dear Ms. Palmieri -- so delighted you found your way to my blog, and thanks very much for your kind words as well! -- I also look forward very keenly to seeing the finished book, and hearing what my Italian-speaking friends can tell me about it. I've heard great things about your work and I'm very grateful for your taking on the challenge of Toby's voice.